Only about five bags’ worth of gravel still left on the driveway, with several mud-prone areas now looking much neater and the front walk ready for the next phase: more digging, garden prep and planting. Oh, and if we must, planning. 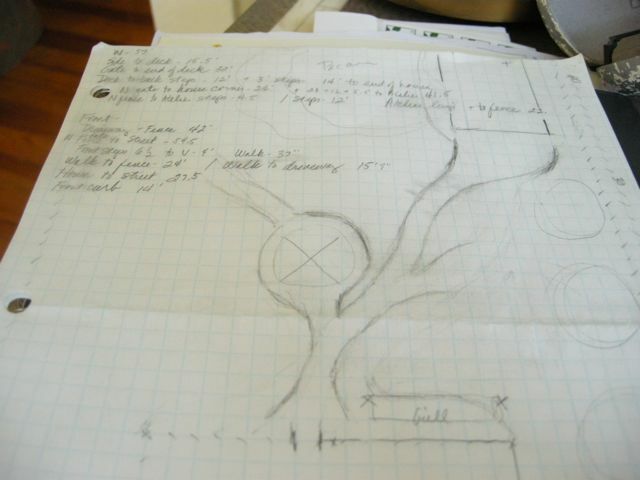 Rough sketch of backyard paths. We’ve dutifully measured every aspect of the yard – distances between fences, between house and fence, between house and street, between house and Parthadon (more on that later) and applied it to graph paper. 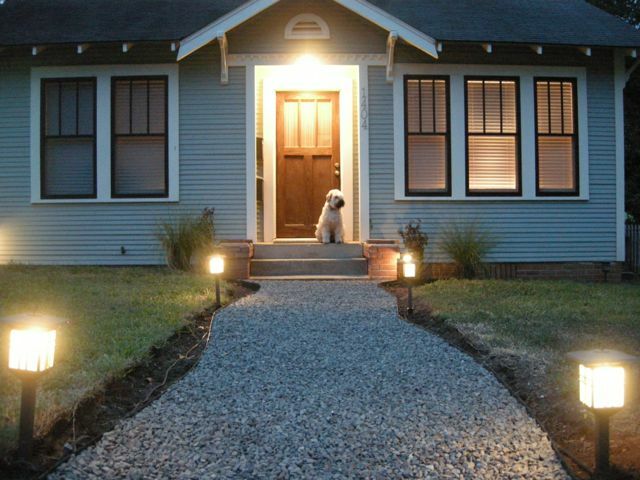 I spent a good part of a Saturday toying with the way the front might look using the garden planning tool at Better Homes & Gardens website, www.bhg.com. They’re just approximations because the plants on their list aren’t the plants I have on my list, or even right for Brenham’s climate, but I just chose things that looked similar to what I have in mind to create a picture. It’s a fun exercise. The real problem with formal planning? 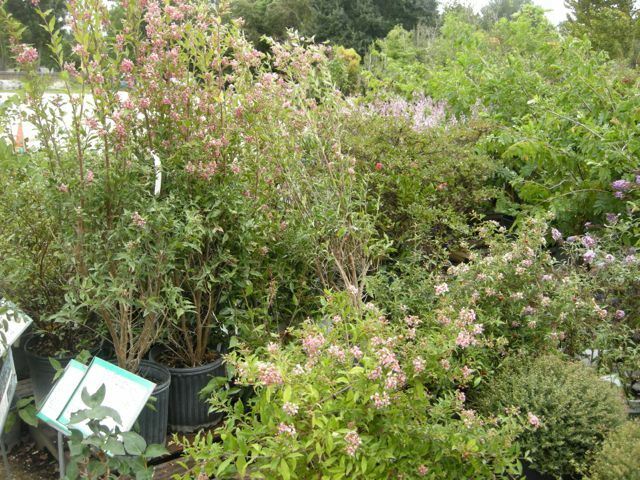 Unless you hire a professional designer or use the most common plants, you’re going to go to the nursery with a list, find maybe a third of what you’re seeking and a half-dozen plants you hadn’t considered yet and, well, it just goes where it goes from there. Gardens have to evolve over years, anyway. Otherwise they’re just landscapes. I am, however, trying to be disciplined this time with a palette: I have made plant lists all summer with the idea of keeping the front yard to three tones: silver/blue gray, burgundy and apricot. So… We stopped Sunday on the way back from Houston – a particularly long, roundabout way – at one of my favorite nurseries, The Arbor Gate, to see if we could find the perfect arbor for that new front walk. We had the small car already crammed with the dog and some citified groceries and whatnot. It was unusually cold and blustery, on the heels of a front, but it didn’t take long to spot a few discoveries I will now have to go back for — plans be damned. Barbados cherry was one of my all-time favorite shrubs at our last garden, both for its carefree nature and its pretty little pink flowers. I was pruning them into small trees. Until Sunday I’d never seen them any larger than a gallon pot at a nursery. Swoon. 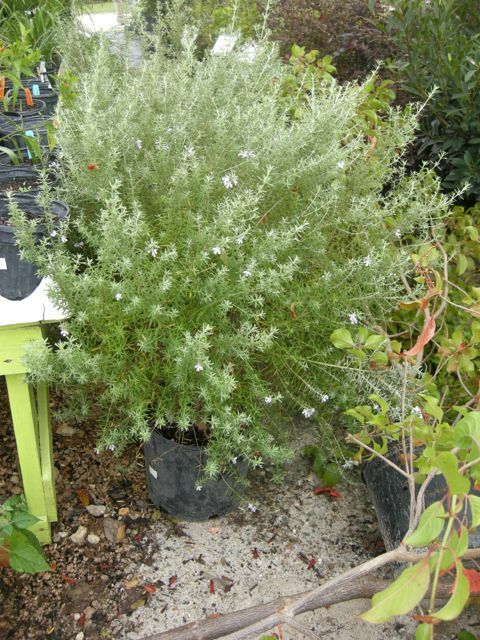 ‘Rio Bravo’ sage alongside salvia leucantha. And how could you not love this? 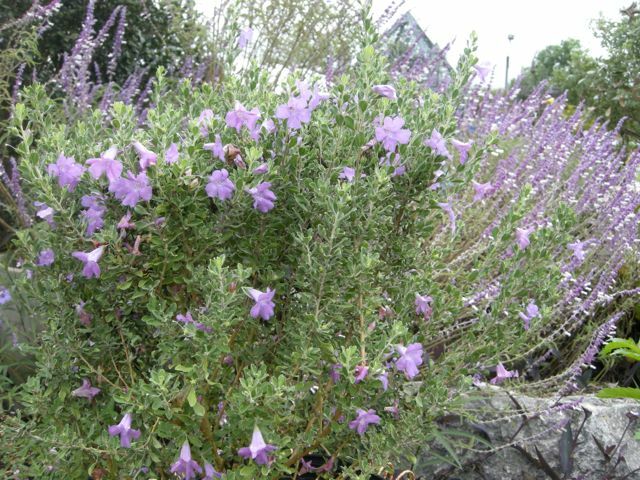 Westringia rosmarinifolius – as the name suggests, a little like rosemary but delicate-looking. Lavender is trying to creep into my scheme. Good thing the car was full and we weren’t dressed for the chill. We had room for exactly two plants, which I scored in about five minutes: Artemesia ‘Colchester White,’ which apparently doesn’t sucker; and David Austin’s “Jude the Obscure” rose, which seduced me with one gorgeous, peachy-cream blossom. This entry was posted in Garden and tagged 'Rio Bravo' sage, barbados cherry, garden, landscape, plan, The Arbor Gate, westringia on October 2, 2012 by Molly Glentzer.